For the biographical film, see Effie Gray (film). Euphemia Chalmers "Effie" Millais, Lady Millais née Gray (7 May 1828 – 23 December 1897) was the wife of the critic John Ruskin, but she left her husband without the marriage being consummated. She later married his protégé, the Pre-Raphaelite painter John Everett Millais. This famous Victorian "love triangle" has been dramatised in plays, films and an opera. 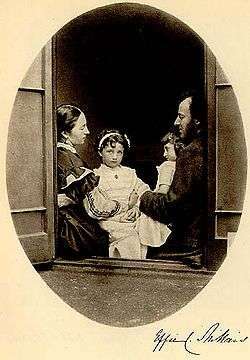 Albumen print photograph by Lewis Carroll from 21 July 1865 depicting Effie Gray, John Everett Millais, and their daughters Effie and Mary at 7 Cromwell Place, signed "Effie C. Millais". Effie Gray, initially known by the pet name of "Phemy", was born in Perth, Scotland, and lived in Bowerswell, the house where Ruskin's grandfather had committed suicide. 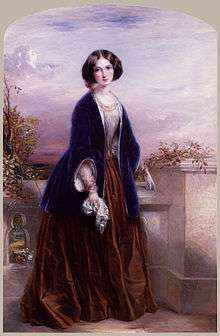 Her family knew Ruskin's father, who encouraged a match between them. Ruskin wrote the fantasy novel The King of the Golden River for her in 1841, when she was twelve years old. After their marriage in 1848, they travelled to Venice, where Ruskin was researching his book The Stones of Venice. Their different personalities are thrown into sharp relief by their contrasting priorities. For Effie, Venice provided an opportunity to socialise while Ruskin was engaged in solitary studies. In particular, he made a point of drawing the Ca' d'Oro and the Palazzo Ducale (Doge’s Palace), because he feared they would soon be destroyed by the occupying Austrian troops. One of the troops, Lieutenant Charles Paulizza, made friends with Effie, apparently with no objection from Ruskin. Her brother, among others, later claimed that Ruskin was deliberately encouraging the friendship to compromise her, as an excuse to separate. "He alleged various reasons, hatred to children, religious motives, a desire to preserve my beauty, and, finally this last year he told me his true reason... that he had imagined women were quite different to what he saw I was, and that the reason he did not make me his Wife was because he was disgusted with my person the first evening 10th April." Ruskin confirmed this in his statement to his lawyer during the annulment proceedings: "It may be thought strange that I could abstain from a woman who to most people was so attractive. But though her face was beautiful, her person was not formed to excite passion. On the contrary, there were certain circumstances in her person which completely checked it." The reason for Ruskin's disgust with "circumstances in her person" is unknown. Various suggestions have been made, including revulsion at either her pubic hair, or menstrual blood. However, Robert Brownell, in his analysis Marriage of Inconvenience, argues that Ruskin's difficulty with the marriage was financial and related to concerns that Effie and her less-affluent family were trying to tap into Ruskin's considerable wealth. While married to Ruskin, she modelled for Millais' painting The Order of Release, in which she was depicted as the loyal wife of a Scottish rebel who has secured his release from prison. 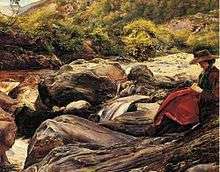 She then became close to Millais when he accompanied the couple on a trip to Scotland in order to paint Ruskin's portrait according to the critic's artistic principles. During this time, spent in Brig o' Turk in the Trossachs, they fell in love. While working on the portrait of her husband, Millais made many drawings and sketches of her. He also sent humorous cartoons of himself, Effie and Ruskin to friends. She copied some of his works. After their return to London, she left Ruskin, nominally to visit her family. She sent back her wedding ring with a note announcing her intention to file for an annulment. With the support of her family and a number of influential friends, she successfully pursued the case, causing a major public scandal, and their marriage was annulled on the grounds of 'incurable impotency' in 1854. In 1855, she married John Millais and eventually bore him eight children: Everett, born in 1856; George, born in 1857; Effie, born in 1858; Mary, born in 1860; Alice, born in 1862; Geoffroy, born in 1863; John in 1865; and Sophie in 1868. Their youngest son, John Guille Millais, was a notable bird artist and gardener. She also modelled for a number of her husband's works, notably Peace Concluded (1856), which idealises her as an icon of beauty and fertility. When Ruskin later sought to become engaged to a teenage girl, Rose La Touche, Rose's parents were concerned. They wrote to Gray to ask about the marriage; she replied by describing Ruskin as an oppressive husband. The engagement was broken off. Gray in middle age, painted by Millais. She is holding a copy of the Cornhill Magazine. After his marriage, Millais began to paint in a broader style, which Ruskin condemned as a "catastrophe". Marriage had given him a large family to support, and it is claimed that his wife encouraged him to churn out popular works for financial gain and to maintain her busy social life. However, there is no evidence that she consciously pressured him to do so, though she was an effective manager of his career and often collaborated with him in choosing subjects. Her journal indicates her high regard for her husband's art, and his works are still recognisably Pre-Raphaelite in style several years after his marriage. However, Millais eventually abandoned the Pre-Raphaelite obsession with detail and began to paint in a looser style which produced more paintings for the time and effort. Many paintings were inspired by his family life with his wife, often using his children and grandchildren as models. Millais also used his sister-in-law, Sophy Gray, then in her early teens, as the basis of some striking images in the mid to late 1850s, provoking suggestions of a mutual infatuation. The annulment from Ruskin barred her from events at which Queen Victoria was present. Both she and her husband were considerably bothered, as she had been socially very active, although many in society were still prepared to receive her and to press her case sympathetically. Eventually, when Millais was dying, the Queen relented through the intervention of her daughter Princess Louise, allowing Gray to attend an official function. Sixteen months after Millais' death, Effie died at Bowerswell on 23 December 1897 and was buried in Kinnoull churchyard, Perth, which is depicted in Millais's painting The Vale of Rest. Wikimedia Commons has media related to Effie Gray. The Love of John Ruskin (1912), a silent movie about Ruskin, Gray and Millais. The Love School (1975), a BBC series about the Pre-Raphaelites, starring Anne Kidd (Gray), David Collings (Ruskin), and Peter Egan (Millais). John Ruskin's Wife (1979), a novel about the relationship by Eva McDonald. Dear Countess (1983), a radio play by Elizabeth Morgan, with Derek Jacobi (Ruskin), Bridget McCann (Gray), Timothy West (Old Mr Ruskin) Michael Fenner (Millais). 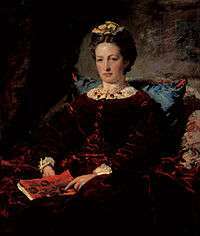 The author played Ruskin's mother. The Passion of John Ruskin (1994), a short film directed by Alex Chappel, starring Mark McKinney (Ruskin), Neve Campbell (Gray) and Colette Stevenson (Gray's voice). Modern Painters (1995), an opera about Ruskin, Gray and Millais, music by David Lang, libretto by Manuela Hoelterhoff. Parrots and Owls (1994) a radio play by John Purser about the O'Shea brothers in which Gray appears as a friend of James O'Shea and her marital problems are discussed. The Countess (1995), a play written by Gregory Murphy concentrating on the breakdown of the marriage between Ruskin and Gray. The Order of Release (1998), a radio play by Robin Brooks about Ruskin (Bob Peck), Gray (Sharon Small) and Millais (David Tennant). The Woman Who Gave Birth to Rabbits (2002), a collection of short stories by Emma Donoghue, contains a story "Come, Gentle Night" about Ruskin and Gray's wedding night. Mrs Ruskin (2003), a play by Kim Morrissey about the breakdown of the marriage and Gray's fraught relationship with Ruskin's domineering mother. Desperate Romantics (2009), a six-part BBC television drama serial about the Pre-Raphaelite Brotherhood. She is played by Zoe Tapper. Effie Gray (2014), a film produced by Emma Thompson with Dakota Fanning as Effie, Tom Sturridge as Millais and Greg Wise as Ruskin. ↑ James, William Milbourne, ed. (1948). The Order of Release: The Story of John Ruskin, Effie Gray and John Everett Millais Told for the First Time in their Unpublished Letters. University of Michigan: J. Murray. p. 1. ↑ Prodger, Michael (2013-03-29). "John Ruskin's marriage: What really happened". Guardian. Retrieved 2015-03-24. ↑ National Records of Scotland, Annulment recorded in Kinnoull Kirk Session Minutes (NRS ref. CH2/948/7), 1854, pp.223-227. ↑ James, W. (2008). The Order of Release - The Story of John Ruskin, Effie Gray and John Everett Millias. Read. p. 251. ISBN 978-1-4437-0293-5. Retrieved 2010-02-27. ↑ Dakota Fanning and Emma Thompson Team for 1850s Victorian Drama "Effie"